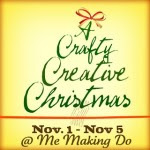 First up is A Crafty Creative Christmas going on NOW at Me Making Do. Heather has put A Lot of work into the festivities going on at her blog this week. She has tons of giveaways and guest posts. Really great giveaways and guest posts. (if I do say so myself). There have already been 3 (I think?) giveaways and despite the fact that sending you over there lessens my chances of winning everything for myself – I’ve decided to be a giver and let you know so I don’t end up with coal in my stocking. You will see me there later this week – so make sure you check in often!! Next up is Crazy Christmas Crafter Month with I heart Naptime. Note – If you haven’t stopped by to see Jamielyn’s new little darling – you must!! She’s gorgeous! :) She deserves the New Mommy/Blogger of the Month award for organizing all of this with a newborn! The lineup for this month-long Christmas spectacular is Amazing. I’m a little intimidated to be in this bunch. Ok. A lot. But you must stop by – there is an amazing guest post every day and on Saturdays a link party and giveaway. There is sure to be tons of Christmas inspiration for you. And prizes. Which there are never enough of, right? Because you know I can’t resist a challenge – I’ve entered Sew Much Ado’s Copycat Challenge. You can enter too!! She has three categories – Clothing, Jewelry/Accessories, and Home Decor. Sweet huh? You can check out all the rules and how to enter here. There are some pretty amazing prizes for each category. So Go! Enter! Win! Well. See ya around the parties! « Vibrant Designs Clutch Tutorial and Giveaway! Girl!! You are one busy bee!! Can’t wait to see what you come up with for them all! Wowza! Now i need to go check out all of these! Thanks! Look at all of this fun stuff…how do you find the time! I am trying to get in that Christmas mood…maybe this will help! Please check out my blog if you get the chance. Any feedback is appreciated!